The Alley Katz’ first Cd is here! Released in September, 2005. And selling like hotcakes! The Cd features Chris Leigh, James Cloyd, Jr., and Billy Reyna at their best. All songs are origional but 3. Below is the song order and info. Yup! Its finally done. I picked up the first pressing on Friday September 16th, 2005. 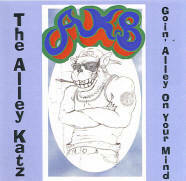 This First CD features the Alley Katz Band at its best. James, Chris & Billy are well suited for recording together. The release contains 14 songs all but 3 are origional! vocal by James Cloyd, Jr.
written by James Cloyd, Jr.
Mike Boulan – Thanks for all your help, input, and the opportunity to record this CD. Your deep vision has definitely put the Detroit blues scene back on the map. Thanks from us and all the musicians your efforts have touched. Jumpy and Bernadette – Your support and efforts are ever appreciated. Truer friends come few and far between. 2 new CDs to benefit Katrina Victims have been released. Musicians at No Cover productions, a few others and No Cover president Mike Boulan have donated their time and talents to put together a CD of that Detroit blues that you love so much. This CD will feature more than 15 of Detroit’s best recording artists. All proceeds will go to the Red Cross fund for Katrina victims. Christopher Leigh from the Alley Katz Band donated two of his own original songs to the effort, Voodoo Boogie, and Stayin’ Home. Booth songs were written within the week of the recording and most of the other artist’s songs were as well. Talk about fresh off the press, these CD’s are as fresh as they possibly can be! These CDs and the musicians that performed on it will be showcased on The Blues For Katrina Record Release Party at Memphis Smoke located on Main St. and 11 Mile Rd in Royal Oak, MI. on Sunday April 9th 2006. So be sure to attend. You could be the first on your block to get the No Cover Productions Blues For Katrina, Hurricane Relief From Detroit CDs. These people really need our help. Many are still homeless. When I think of all the influences I have benefited not just from the rich heritage of New Orleans culture, art, music, and history but also the other areas of Louisiana and the South that were destroyed, it burns me to the soul to know that these people are still suffering. So please, let’s do our part to get these people back home! Buy the Relief CD or donate your gifts directly to the Red Cross. You can click over to No Cover Productions to order your copies today!